You are here: Home>Archive>Taylor Brown Collection.>Marriages.>Frank Brown and Beryl Taylor on their wedding day. 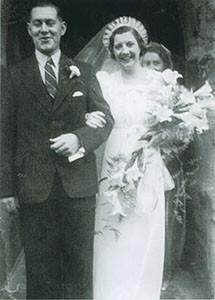 Frank Brown and Beryl Taylor on their wedding day. Photograph of Mr. Brown and Miss Taylor after their wedding, showing them leaving the church. They are both smiling; there is a lady behind the bride’s shoulder.